Centre, John McDonald made an impressive Bulimba Cup debut for Towoomba in the Clydesdales 27-18 loss to Brisbane at Lang Park, with the Courier-Mail’s Jack Reardon tipping State honours for ‘cracker’ in 1965, if not sooner. McDonald went on to make his State debut in ’65, as Reardon predicted, and ultimately played 13 Tests for Australia. He was Queensland’s inaugural State of Origin coach in 1980 and was a long serving chairman of the QRL. A crowd of 15,000 turned out for a round 5 BRL match between Norths and Valleys, with young Norths second rower, Alan McLean starring in the Devils’ 18-13 win. 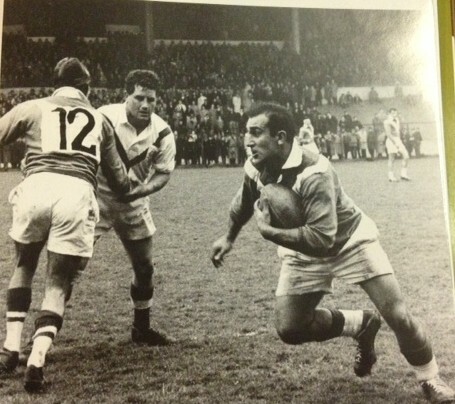 Only five of the 1960 French touring side were chosen for France’s 1964 down under tour – centres Claude Mantoulan and Bernard Fabre; utility back, Raymond Gruppi; lock Georges Fages and second rower, Robert Eramouspe. France’s fullback was Andrew Carrere – nicknamed ‘fractures’ after suffering 17 bone breaks in 12 years. Arguably the biggest blow to France’s tour chances was the unexpected retirement of their Test skipper, Jean Barthe from Carcassonne. A former union great, Barthe was one of the stars of the 1960 tour. Almost as significant was the withdrawal of another former, Test skipper, Marcel Bescos, rated by Great Britain hard man, Cliff Watson as the toughest prop he ever faced. Bescos, who played for the Albi club, was an antiques dealer away from football. He died only last year.